Today is a great day and a very important one. Today is the release day for Darklight and Daydreams! Darklight and Daydreams is a charitable anthology that will benefit disaster relief efforts in Puerto Rico, and I'm proud to be a part of it. It seems like I’ve been working on this anthology and keeping it a secret forever, but the day has finally come where I can talk about it and what it means to me. I hope you’ll bear with me as I do my best to pull my thoughts together. Welcome to the first ever Pages of Fear blog hop. It’s a pre-Halloween event celebrating authors who like to fright and delight with their writing. As you progress through the twenty-eight blogs/websites you’ll learn about authors you may already know and be introduced to some new ones. Everyone loves the opportunity to get something free. All of the authors have gathered together to give ONE lucky winner signed copies of their books (one per author). Plot Twist! When Life is Unpredictable. I've missed this blog and I've missed all of you so much. Saying my life hasn't gone according to plan these last nine months should be the definition of an understatement. Actually, it's a long story. The kind of story with many twists and turns that teaches people something. I've decided that I'd like to share it with all of you and I hope you'll find it worthy of reading. Once Upon a Book Ticket Giveaway! Hey everyone! I've been super busy lately. My first priority is getting well enough to leave this rehab center. (Yes, I'm still there.) But on top of that I've been trying to stay upbeat by doing as many productive things as possible. This includes scheduling signing events for the summer (four in total so far,) … Continue reading Once Upon a Book Ticket Giveaway! I mentioned in a previous post that one of the things I was working on was the second part of The Desiccated. Today I'm excited to reveal the cover and blurb for it! I absolutely LOVE this cover. Marsha Keeney of MK Photography took amazing photos that really helped set the stage for the feeling I wanted the cover to have, while Najla Qamber of Najla Qamber Designs worked her magic to create the atmosphere needed to completely bring the cover to life. Together, the cover was able to become something that's exactly like a scene from the book and so much more than I could ever hope for. I'm so grateful to both of them for all their hard work! The Desiccated Has Been Nominated! Hey Everyone! I haven't been blogging for awhile and here's why: I'm in a rehabilitation center trying to get physical therapy for a lumbar fracture. I spent one month in the hospital and nearly four months here in rehab. I only have my laptop when my papa brings it in the afternoons so it isn't easy to get blogging done. The other reason is that this recovery isn't easy, and there's been many weeks where I've come close to losing hope. I didn't want to talk about that and no one likes a depressed author. Remember how I said I post an announcement when The Desiccated - Part 1 was available for sale? This is it! 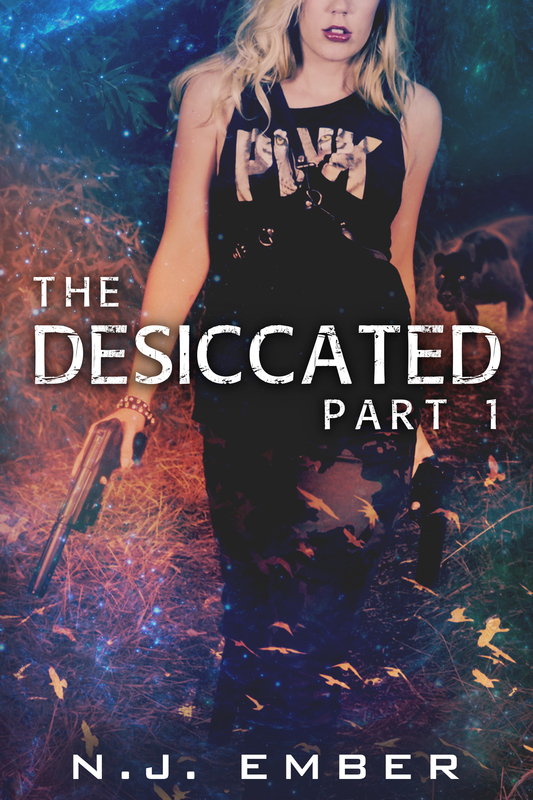 The Desiccated - Part 1 is slowly becoming available in ebook and paperback EVERYWHERE. To find out exactly where you can check this page. (I'm updating it as it becomes available on different platforms so be sure to check back often.) If you're unsure whether The Desiccated - Part 1 is your kind of read, the good news is you can get the ebook for only ninety-nine cents. Are you convinced yet? No? Well, you can always look at the free sample, too. My First Author Signing at OUAB!